reBlog: Harryhausen in da House! Well this week was a very special week here at work. 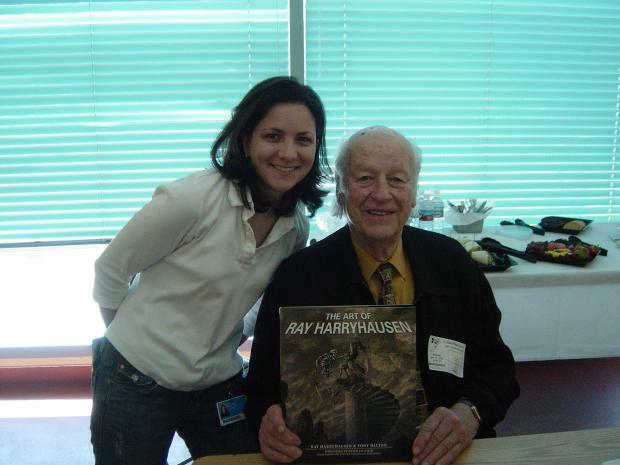 We all got to meet the legendary animator Ray Harryhausen. He came by the studio to promote his new book. 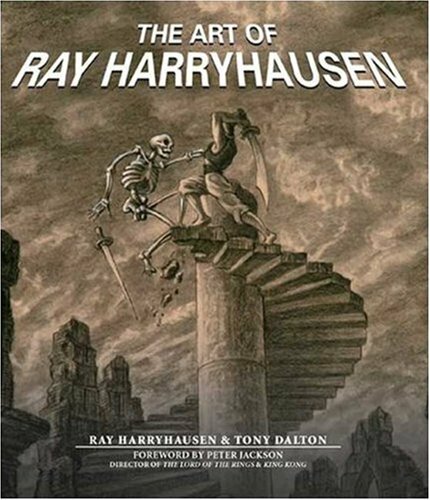 The Art of Ray Harryhausen. This visit really got me to thinking about the old movies that inspired and mesmerized me when I was a kid. Back then I was completely enthralled in the creatures this man brought to life. He really is the "10th old man" of sorts. 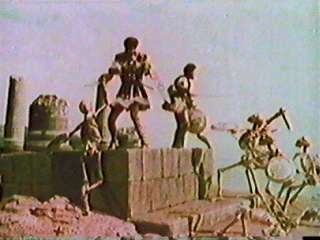 I mean... it's stop motion animation, not hand drawn but the principles stay the same and in one sense I think the animation that Ray did back then was in many ways way more complicated to work out 'cause he had to match up live action footage to his animation... and back then... there was no 3D software package to facilitate the process. Can you imagine! This guy really pioneered techniques in animation! And today we're all indebted to his efforts. Even the greats such as Pixar and Weta have paid homage to him in their films. It's pretty amazing all the work this man has created and inspired. If you haven't already... I highly recommend checking out his new book there's a ton of insipational images and stories. Wow. That must have been amazing to meet him in person! A true living legend. I'll be getting that book for sure. Lucky you Reb! My 1st movie by Mr. H was Sinbad. Those skeletons were, and still are, quite fearsome. It's so cool getting to see your inspirations in person! I saw Frank and Ollie a few years back and they were just so awesome. Such great senses of humor and wonderful stories to tell. Awesome Reb! We got to meet him a few years back when he was up here doing a talk. Getting to hear him speak on what it was like working on those films was a true joy. He is such an amazingly nice man who seems genuinely surprised to have everyone hanging on his every word. A real treasure! Sara- Absolutely, he is an amazing pioneer! And it was really incredible getting a chance to meet him! drp- Yo! Yeah... I was deathly afraid of the whole madusa animation!!! That had me shutting my eyes every 2 sec! erica- Oh man... we got to see Ollie a few months back on his 93rd B-day they had a whole celebration here at work and showed his film "Frank and Ollie" It was truely one of the most magical days here for me. I thought I was dreaming!! brian- No kidding Harry is such a sweet and inspiring guy... truely humble! I've just started blogging. Its great! what an amazing day to meet Harry, I'll never forget it either, and that is such a great picture of you 2!! Remember how everyone was so excited and on the edge of their seat, it's cool to see your animation supervisors go a little weak in the knees at such a legend. Hey Dan! Unfortunately the visit didn't include a lecture ;( His book is full of tones of info and pics you're gonna love it! toucan, Awesome... it's so inpiring to meet these great artists Many well wishes on your studio ambitions! Anthea, Absolutely it was super sureal to see the animators we admire just as excited about Ray's visit! Very very cool!